Hardcover, 144 pages, (June 1983) Usually ships within 2-3 days. This first modern critical edition of Esule dalle sfere (1690) exhibits Stradella's architectural genius and sensitive treatment of text. Vocal instrumental forces include two soloists, a four-voice chorus, violin, and continuo. 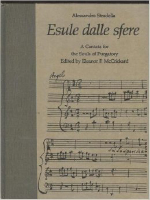 The edition contains an English translation of the libretto, historical background and commentary, a discussion of performance problems, and a comparison of the two manuscript sources on which the edition was based.